Daddy's Blind Ambition: Guess What Matt Did on Sunday?! 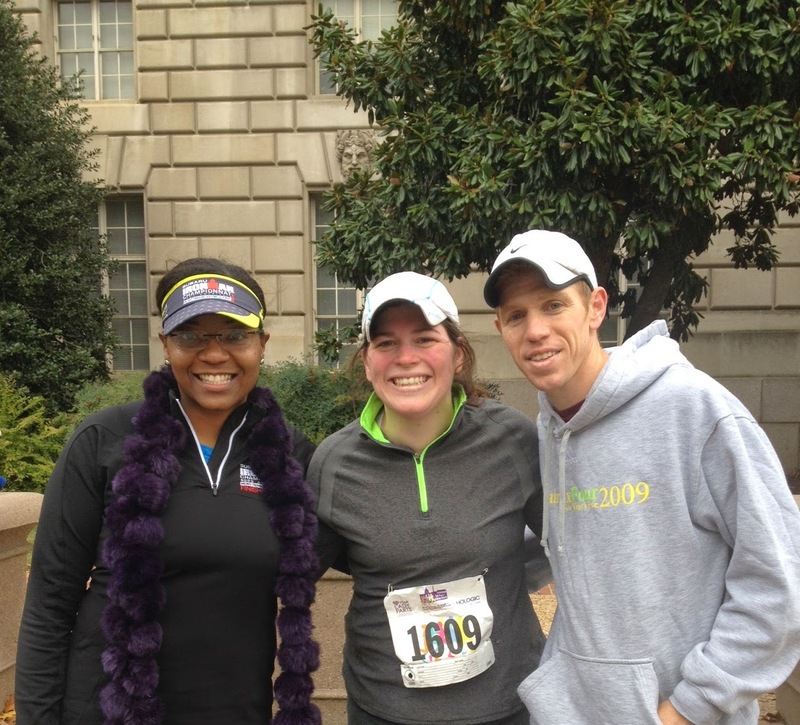 On Sunday, November 2nd, Matt, Shelly and I ran in the National Race to End Women’s Cancer 5K that started and finished at Freedom Plaza in Washington, DC. 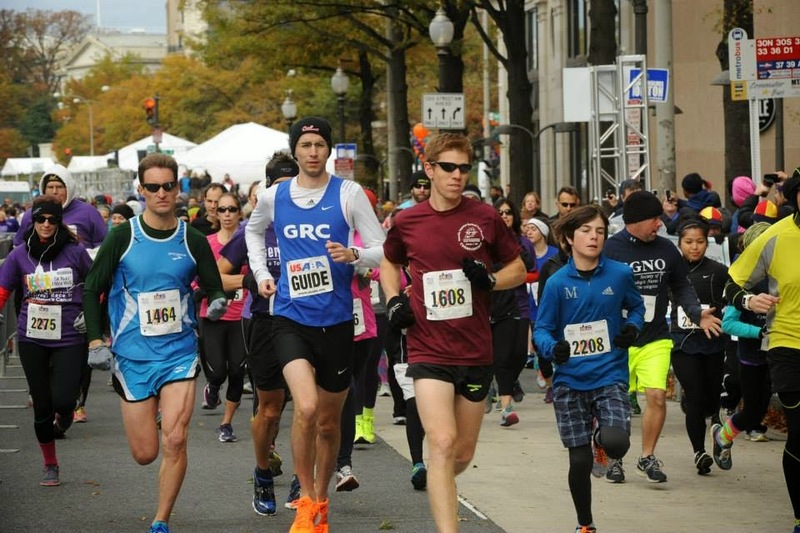 The race is put on by the Foundation for Women's Cancer to raise awareness to prevent, detect, treat and defeat women's cancer and provide crucial grant funding to researchers. Every seven minutes a woman is diagnosed with a reproductive cancer. That needs to change. The race website says that the race raised $463,991 yesterday. It’s not too late to donate! 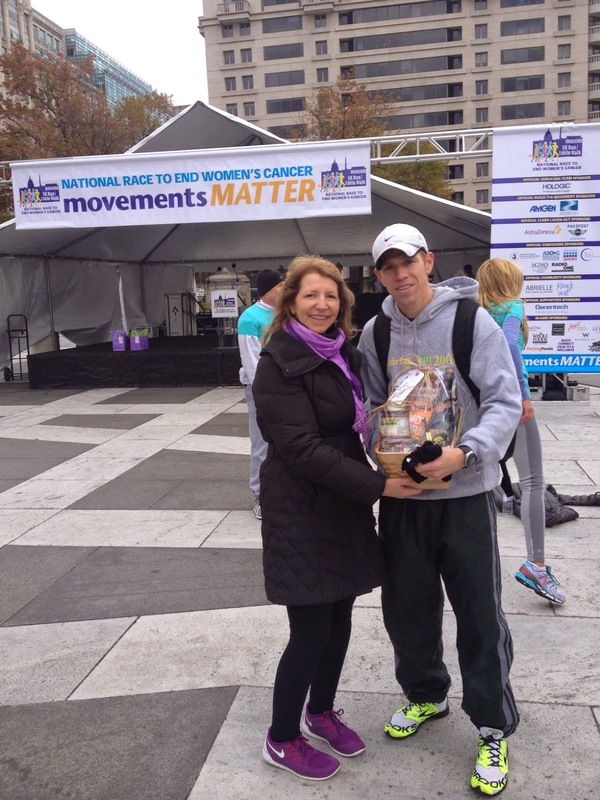 We ran the race in support of my mom, Diane, who is three and half years in remission from endometrial cancer. Go, Mom! She was out in the blustery cold yesterday morning wearing Zachary and pushing the twins in the stroller to cheer on the three of us as we ran. It was a beautiful morning for a race and I particularly liked the 9am start—much more manageable with three little ones! The race had a number of turns and turn-arounds so Matt was fortunate enough to have a guide, Chuck, from the Georgetown Running Club, guide him on the race course. Last year Matt ran this race (which was an 8k) without a guide and overshot a turn and lost his third place finish. (Not that there is anything wrong with being the fourth placed male finisher!) This year, however, with a guide, he was the OVERALL WINNER with a time of 18:15!!! To quote our daughter Emily, “Daddy was faster than everyone else today!” I finished about ten minutes behind Matt, but Marisa still said I ran “very, very fast” so I appreciate her support, too. Since it was an out-and-back they got to see us all twice on the race course. 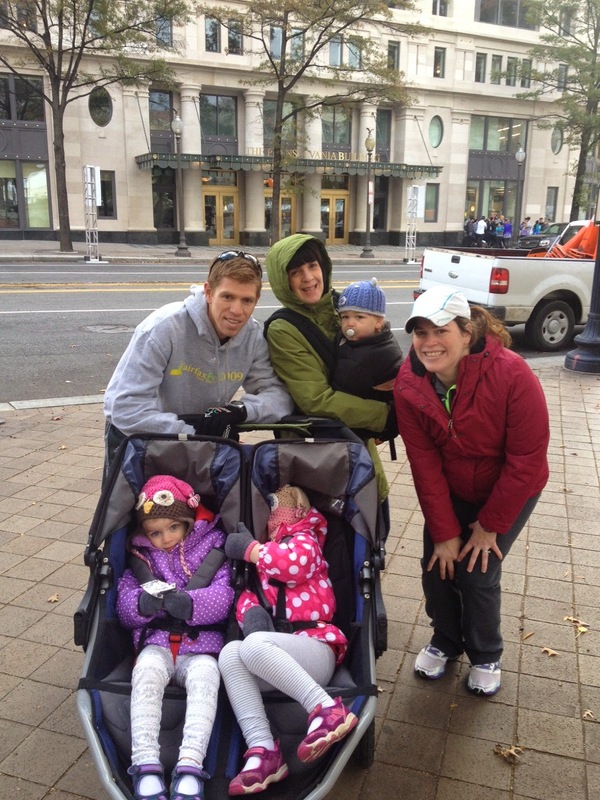 It was so much fun and we loved running for such an important cause. As if getting up and WINNING a race wasn’t enough for Matt, he decided to add on an additional TWENTY miles. Originally when we signed up for the race Matt was going to do his long run on Friday like usual, but that would have meant racing on very tired legs. Instead I came up with the ingenious idea of racing the race on fresh legs and then running home. The good thing about a long training run is that you just have to finish it. It doesn’t really matter your pace. The kids (and Granma) were cold so I took them home and Shelly and Matt went to get his award. Thank you, Shelly! Unfortunately the awards ceremony happened earlier than scheduled so Matt missed getting to go up on the podium in front of everyone, but Shelly did get a picture of him with the race director and his award basket from Whole Foods. 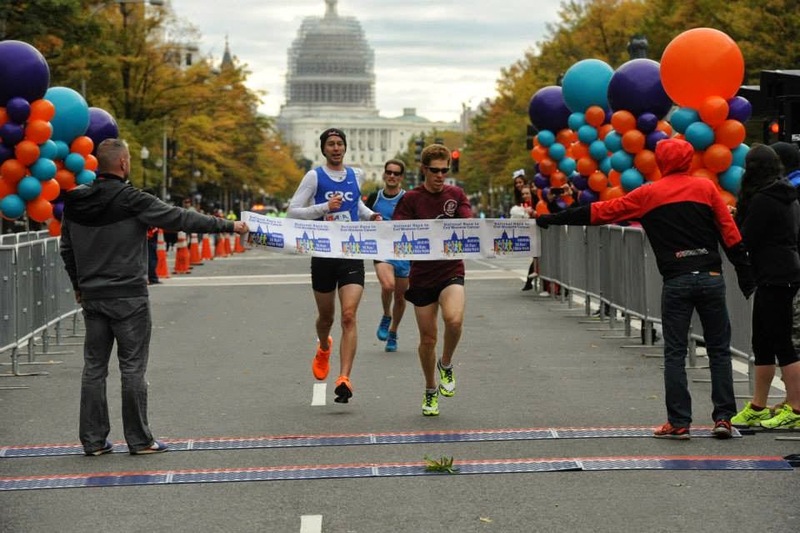 Watch out California International Marathon—Matt Rodjom is training to have an awesome finish! !